Now here is v0.57b of my French translation. Here is v0.58 of my French translation. Here is v0.58b of my French translation. Firstly, I made (and unmade) several changes a few months ago, but some of what I did (and undid) was reverted by harry (although he also fixed some problems as well). Now I have no idea what the current state of the translation is . If you see a mistake, by all means, fix it. Secondly, you correct regarding that the original is more typical. The reasoning for my choice of "est délirant/e" was twofold. #2) Most importantly, I believe many of the soldiers names will not fit in the battle-scene window box if I change it to something like "est devenu/e fou/folle". Especially now that we have dozens of new and longer names in the .nam files. I could be wrong about this though. I had to change the translation in other parts of the game for the same reason (most notably, the Graphs). Since you want me to change it, I'll look into it sometime today. I do want nothing in particular, it was just to share this information. This is the strong part of this opensource remake : all is modable and accessible by everyone. So I changed it on my version, because seing "est délirant" was not very funny for me, and now I am happy. And, once more, thanks for the great job you all do ! If text doesn't fit even though there should be enough room, let me know. I've been fixing such problems reported by translators, and I believe that Infobox is one of them so it should fit a lot more text now. Well SupSuper, it's not just that. It's about trying to make the game flow better and more readable to the audience. To do that, you'd need a separate string for every object/noun that was masculine/feminine. That's a whole lot of unnecessary complexity. Again, I'd rather not make the .lng file any more complex. I think you can understand . I'll just try other solutions, like maybe "Roquettechar" or something . You misunderstand me, Aldorn. I very much need your criticism . Seriously, I'm often careless, hasty, and lazy, so don't hold back (because I want this to be good). Ultimately I'd rather reach a consensus and find something that suits everybody, maybe even changing it back to something like "est devenu/e fou/folle". If you have any other suggestions for this case, they would be greatly appreciated. In English it was something like "Hovertank" originally. I toyed with calling it aéroglisseur, but a hovercraft isn't necessarily militarized. I can't call it a "Flottant" tank since we already have this pronoun for the race of floating aliens. I can't call it a chasseur since it's not a jet. So I ended up calling it a aérochar; its sort-of like an aéronef, except it's also tank. For non-French speakers, I'm basically calling it an aerotank, if that makes any sense. Anyway just a small glimpse into the mind of a powermad translator who has to act like a linguist . 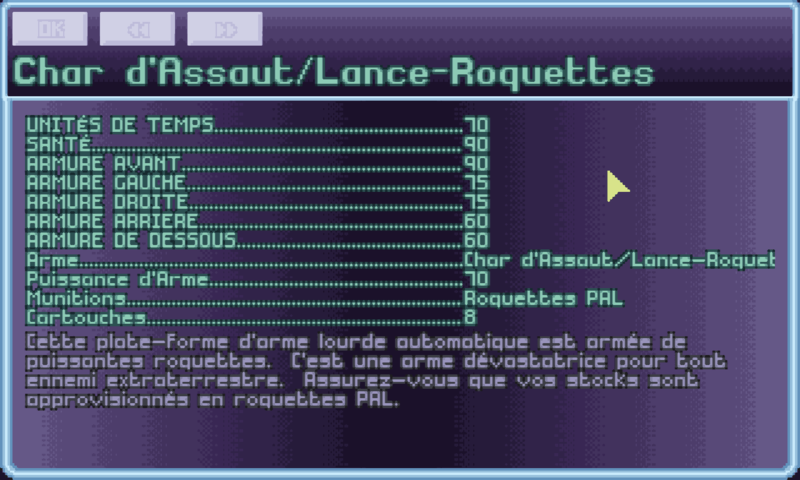 So, if you need my opinion, I had a look at french release (.DAT files), this was (exact case) : "est devenu Fou"
"Tank/Canon", "Tank/Lance-Roquettes", "Tank/Canon Laser", "Hovertank/Plasma", "Hovertank/Lanceur"
I've fixed this to only show the weapon name like in the original now. Here is v0.58c of my French translation. I'm constantly amazed at the amount of work all of you guys put into the project. Keep it up ! Anyway, here is v0.59 of my French translation with all the new strings. Open Xcom v0.9 is anwsome, but french translation have many mistakes, it's literally burn my eyes ! So I propose this fallow patch, I re-write entire end file (new and advanced options) and correct many problems anywhere. I maybe not see all, please if you see another problem report here ! Below the file to download.